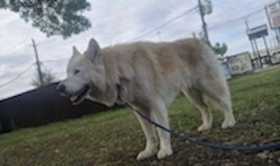 Large white dog missing in Austin area! His name is Blaze and he is a mixed breed. If seen please do not approach him or he may run, he is about 3 years old and means the world to me. He originally went missing in McKinney Falls Park.